Home > Iran, Israel, Middle East	> This One Too Good To Miss – Ahmadinejad and Staff May Be Under Sorcerer’s Spell! This One Too Good To Miss – Ahmadinejad and Staff May Be Under Sorcerer’s Spell! Wall Street Journal reports that Ahmadinejad and his staff may be under a sorcerer’s spell! Mr. Ahmadinejad’s detractors have accused the president and his advisers, including the Presidential Palace’s top imam, of belonging to a cult-like ring that promotes superstition and mystical fanaticism. 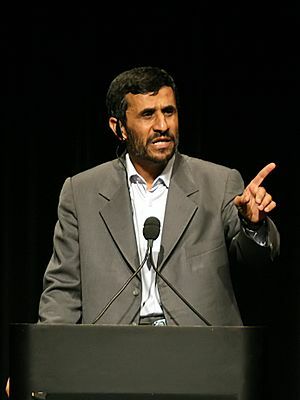 Some have said that Mr. Ahmadinejad is under a spell cooked up by his chief of staff, Esfanidar Rahim Mashaie. Mr. Mashaie is already a controversial figure for promoting nationalism over religion, and for his alleged affinity for astrology and mysticism.